Alcohol can be seen in dreams in a number of different ways and have a number of different meanings. If you want to understand the meaning of dreaming about alcohol, it is important to look at the context in which alcohol is presented in the dream, as well as your own personal views about consuming alcoholic beverages. Strong grain alcohol or bitter alcohol could suggest meaning that you are feeling very strongly about something, or that you feel that you are not doing something in your waking life that is good for you. You may feel that a decision you recently made was too harsh, or that you have been harsh towards someone in your words and actions. Addiction in your dreams may be manifesting your concerns you have about your own or someone else's drinking habits. It could also suggest that there is something in your life that you feel out of control towards. This means you may feel good about recent decisions and that success may seem within reach concerning a project you are working on. Conversely, if you dream that you drink too much or you feel hungover after a celebration where alcohol is involved, it could mean you feel that you may not be completely honest with your true feelings or may have mixed feelings about the details relating to the celebration in your dream. Alcohol in excessive amounts can be dangerous and damaging for our health. Dreaming of alcohol may mean that you need to examine your own health and wellness habits and that you need to start making positive changes to live a healthy lifestyle. It may also mean you are feeling unresolved feelings of guilt. It's also important to consider what type of alcohol is present in a dream. Many times, this can provide more clues on what your dream may mean. Are you drinking whiskey, wine, or beer? Each of these can provide more context into what the dream symbol alcohol may mean to you. Dreaming of Hard liquor drinks, such as whiskey, bourbon, vodka, and rum can be a sign of feeling like you are going through hard times. 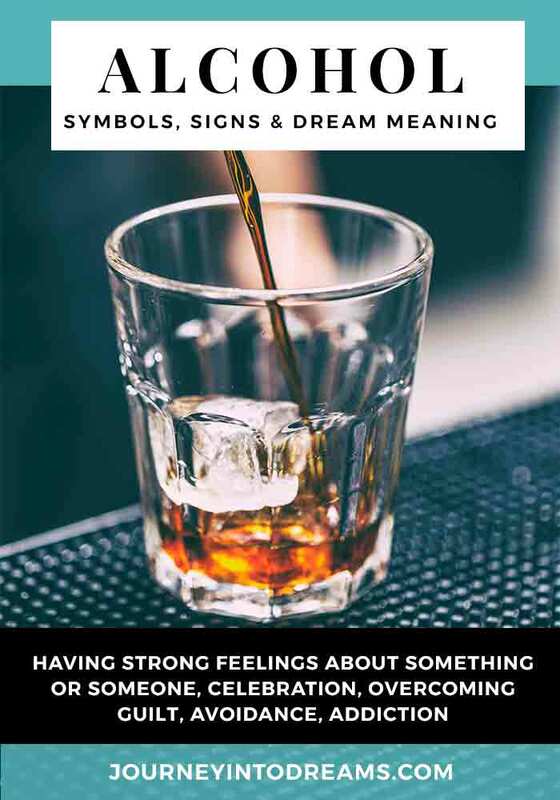 These are very strong drinks, so this could also mean when these types of drinks are present in a dream that you have very strong feelings about something or someone. Look to the other details of the dream to understand what you may be feeling strongly about. Another word used for hard liquor is spirits, and yes, alcohol can be a sign or symbol for needing to become more spiritual or to pay attention to spiritual needs. Champagne in our dreams is often associated with celebration and toasting. When you notice champagne in your dream, it is a good idea to think about what good things are happening in your life. You may need to focus more on the positive and show some gratitude. Wine in our dreams often is associated with companionship, commiseration, and complimenting others. As a dream symbol, wine could mean you have good friendships, or it could symbolize you are feeling lonely or not confident in your current friendships. Seeing wine in a dream can also be a subconscious play on the word "whine" - which means to complain. Is there something you have been complaining a lot about lately but not seeing results? Do you feel like someone else in your life is whining about a situation? Beer is often associated with relaxing and enjoying time with others. However, drinking too much beer can have negative effects on your health and relationships. If you have a dream about beer, it is possible you need to find a healthy balance between work and fun. Do you have any dreams about alcohol you would like to share? What are your own personal thoughts on what alcohol means as a dream symbol? Tell us about them in the comments below!